Do you own a pet? You want to think about getting one. A pet is a great to keep you company. Whether it’s a dog or a cat, pets can help keep you calm and focused. Older people in particular will enjoy their company, especially if they’re living alone. Loneliness is not a good thing for older people. A pet would be the perfect choice to give them that boost that they need. Loneliness can affect your health. You can start to feel sad, which can lead to you neglecting yourself. People with health problems that own pets will probably live longer than those that don’t have pets. People with pets feel loved and wanted. They may not want a companion living with them. Pets can help people to relax. Petting an animal can help to reduce your blood pressure level. It’s been recommended by doctors to advise their patients to consider getting a pet if they suffer from blood pressure. Pets can also be considered emotion rescuers. There may be a time where the person is going through significant changes in their lives. The pet is able to provide them with unconditional love, something that humans sometimes fail to do. With that unconditional love, people feel as though they have a reason to live on. If you have a dog, they can help to provide discipline. While you’re walking the dog, you are able to make eye contact with other people. Plus, both you and the dog would get plenty of exercise by walking. You would feel at ease and wouldn’t feel stressed. People that have pets are usually happier and keep a positive outlook on life. This is essential for trying to stay young and not age. 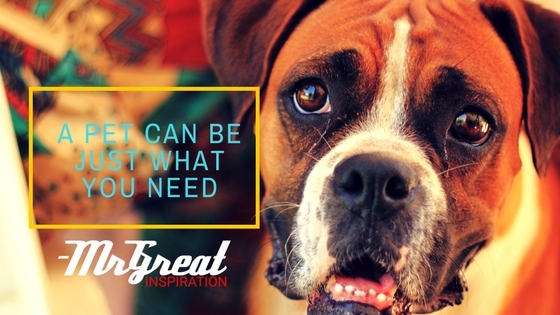 We hope guys you find our article "A Pet Can Be Just What You Need When You Get Old" by Mr Great Inspiration useful.